The AeroVee Laser-Cut "Fence" Baffle Kit provides excellent cooling for the AeroVee line of engines, and other VW aircraft installations. 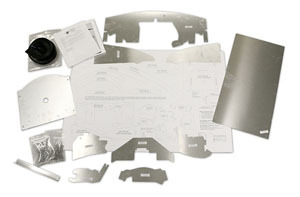 The Fence Baffle Kit is laser-cut to fit every nook and cranny of the VW engine. The fences are sized and contoured for Sonex Aircraft installations, however, the fences may be trimmed or extended by customers as-needed to fit other cowl profiles. The AeroVee Laser-Cut "Fence" Baffle Kit includes all laser-cut baffle parts, rubber baffle seal material, pulled rivets and full installation instructions.